At Thoroughbred racetracks in the United States, the care of expensive, high performing horses is part of a labor hierarchy. Horse owners are the clients of the trainers, paying for the expenses associated with the care and training of their horse(s). Horse trainers are the employers who determine the training and racing regime of the horses under their care. The trainers employ a team of individuals for daily tasks. Exercise riders ride the horses in the morning as they train for the races. Grooms clean the stalls, bathe the horses, brush them, bandage their legs, and feed them. Hot walkers walk the horses around the barn after they train to cool them down. The skills required to care for Thoroughbreds are learned, practiced, and highly valuable to the industry. Yet, equine workers, a label that includes hot walkers, grooms, and exercise riders, often go unrecognized in publicized racing material as well as by many spectators, owners, and trainers. In an interview, a groom said that for many horse race spectators, “we don’t exist.” Fame and recognition are most commonly focused on the horse, jockey, and trainer, which are all highly visible roles. 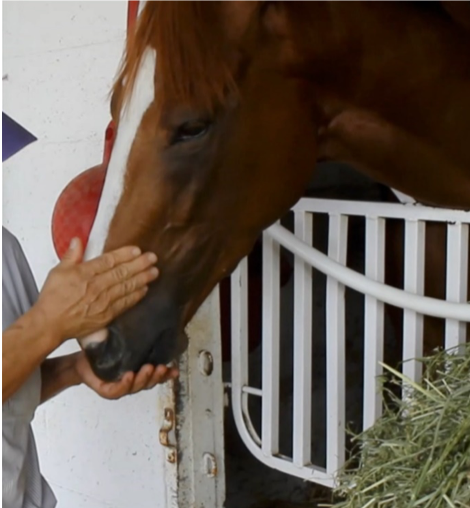 To draw attention to just one set of skills performed by equine workers in the horse racing industry, I focus on a groom’s use of touch as explored in an accompanying video. While it may seem that the groom is performing unskilled manual labor, the skill of his touch reveals that he is actually doing much more. He is building affective bonds with the horses. As the groom bathes the horse, combs the mane, and brushes the coat, he draws peppermints from his pocket, offering them to the horse in the palm of his hand. He picks the hooves clean of dirt, packs each hoof, and rubs the legs before wrapping them in bandages. The true skills involved in this work, however, may not be immediately obvious. Horses cannot verbally communicate, so touch is the basis for a lot of communication between humans and horses (see Argent 2012, Brandt 2004, Haraway 2007). With the touch of his hand, the groom shows the horse where he is and where he wants the horse to move. When the groom is about to perform a particular task, he communicates his intention to the horse through physical contact, such as when he touches the horse’s leg to indicate that he wants the horse to lift its hoof. Grooms often build rapport with the horses through their touch, trying to put the horse at ease and minimize fear. While the groom visually assesses the horse, he also uses his sense of touch to note any signs of cuts, swelling, or heat in an area, which could indicate a medical problem. The groom’s skill at observing any variation in the horse’s physical or mental state makes the groom the primary human observer of racehorses. As the intermediary between the horse and other humans, the groom passes this information to the trainer, who oversees the care of many horses and simply cannot touch every horse in the barn every day. Care of racehorses for many beginning equine workers involves a steep learning curve as they acquire, practice, and eventually master the skills required. The majority of grooms who work at the Kentucky racetrack where I conducted fieldwork are from Guatemala and Mexico, a pattern at most racetracks in the United States. In interviews they said they have learned most of their skills on the job in the United States. Some equine workers began at the racetrack as hot walkers, an entry-level position, with no previous horse experience. Many others had previous experience with workhorses in their home countries, but note that caring for racehorses required a whole new skill set. They explain that in contrast to workhorses, the racehorses are more fragile and potentially more aggressive and dangerous. One woman said she grew up around horses in Mexico, but that they were “mansitos,” or gentle. In contrast, she says the racehorses are different and “más nerviosos,” more nervous. In addition, the routine of the racetrack and tasks to be communicated to the horse are completely different, as is the great attention to details that could indicate problems with the horse. While those with previous horse experience have an easier start at the racetrack, as they already have some skill with human-horse interaction, they must still learn and acquire an entirely new body of techniques for work with racehorses, which includes empathy for the horses’ emotions. The skills of equine workers are often practically valued by trainers since they are indispensable to the industry. 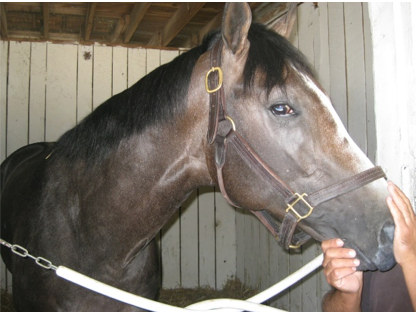 Many trainers prefer to hire experienced, skilled equine workers, including grooms. A trainer told me that when he hires new employees to his barn, he is picky about their skills with horses. When he was looking to hire a new groom during a labor shortage, he was only interested in someone with previous experience. During fieldwork, I witnessed that hiring decisions for grooms are often based on the groom’s reputation with previous employers and coworkers, a recommendation, or a trial period. Yet, at the same time equine workers themselves often feel that their work is undervalued and unrecognized. In the sport of horse racing, their role in the care of the racehorse is often not publicly acknowledged. In addition, the labor conditions are poor. Working at the racetrack, under the majority of trainers, means working seven days a week. The weekly pay rate is low, especially if one has to work extra hours on race days or travel with a horse, as this extra work is often not additionally compensated. This mirrors a similar devaluation of immigrant workers’ skills through poor labor conditions occurring in other industries such as strawberry picking (Holmes 2013) and poultry processing (Stuesse 2016). In interviews and conversations, many equine workers expressed frustration that their employers do not listen to their suggestions, even as the trainers depend on their abilities. A groom told me that when he has tried to express his ideas about what may be better for particular horses, some trainers have told him that “You don’t know. I’m the trainer.” While grooms expressed understanding that the trainers may not want to change their ways of doing things, they experienced this dismissal of their suggestions as a disregard for their knowledge and expertise. At the same time, equine workers expressed confidence in their own skills and the practical value of their abilities for the care of racehorses. A groom with seven years of experience told me, “The more you work with the horses, you learn more about them. The thing is, when they have crazy horses that nobody can handle, I have to do it… I know how I can take control, and then they learn to trust me.” This self-recognition of skill resonates with other studies of immigrant workers in roles that are indispensable yet not publicly recognized (Gomberg-Muñoz 2010; Hondagneu-Sotelo 2007). Horse racing’s labor shows the tension of a system that relies on the skills of workers within an unequal labor structure. Rather than simply performing manual labor, grooms and others who work behind the scenes in the horse racing industry are using skills subtly based on touch and affective interaction with the animals. The skills on which the industry depends are acquired by equine workers and preferred by employers. At the same time, equine workers are towards the bottom of a labor hierarchy. Currently, immigrant workers are primarily the ones who view these jobs as opportunities, where they learn and practice important skills despite the poor work conditions and a lack of public acknowledgement of their skills. This work was supported by The University of California Institute for Mexico and the United States (UC MEXUS). Rebecca Richart is a PhD Candidate in the Department of Anthropology at the University of California, Irvine. Her research interests include immigration, labor, and human-animal relations. She is currently writing her dissertation on social and labor relations in the US horse racing industry. Megan Maurer, Stephanie Friede, and Serena Stein are co-contributing editors for the Culture & Agriculture Section News column.